The Neo is the dedicated wave-freeride kite in the line up, aimed at the rider who values quality waves and needs a kite to perform. Airton Cozzolino chooses the Neo for his demanding style of competitive wave riding on the KSP World Tour. His influence was essential to improve the wave characteristic without loosing the good freeride abilities. This year the Neo comes with a floating strut and the structure of the kite is a little softer to enable the Neo to absorb gusts, giving a smoother power development and allowing the rider even more control on the wave. The struts have also been moved further towards the outside of the kite, this has shifted the centre of gravity allowing the kite to sit further back in the window. This enables the kite to drift down the line incredibly well, allowing you to park the kite and ride the wave without having to worry about it stalling. Additionally it is responsible for an easy and fast relaunch. The Neo is extremely responsive to rider input on the bar, making it easy to manoeuvre on the wave. The lightweight construction makes the kite very lively in the air, but also means there is even less chance of the kite dropping back in the window as you race down the line. If you like riding waves, but don´t want to miss comfort freeriding, the Neo is the kite for you. 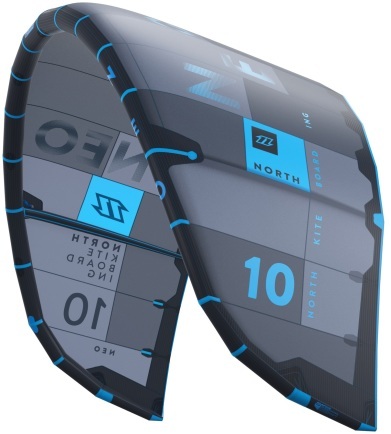 The North Neo is a freeride/wave kite with a compact and rigid 3 strut frame. This rigid form with deeper placement in the wind window is what defines the new Neo. It gives the Neo more low end power, better drift and good feedback on the edge of the wind window. 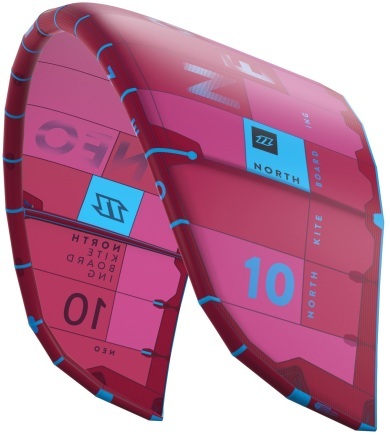 It's a wave kite but also good for beginners if you take the Neo in its low end. In its high end beginners or strapless wave riders have to change to a smaller size. That shifts the best usable windrange of the Neo a bit to the low end. So test also a size smaller before you buy the Neo. Stable, drift, feedback and fast. This new Neo is compact & rigid through the whole serie! That gives this 6m Neo a bit of a hard kite feel. You have soft wave kites like the Cabrinha Drifter, but if you like your kite feel hard, reactive and with a great drift. You have to try the 6m North Neo. The Neo really changed when you compare it with the Neo 2013. This new Neo is more compact, direct and stronger than the 2013 model. Great low end great for beginners but in its high end a kite for intermediate/experienced riders. Why? Well because of that new extra power this kite generates.